What is it? A game about killing giant ogres. When one of Extinction’s giant, screen-filling ogres first lumbers into a level, it’s hard not to be impressed by the sight of it. The scale of these ugly, armoured brutes is awe-inspiring, and you wonder how you—a relatively tiny, sword-wielding warrior called Avil—could ever hope to topple such a colossal creature. But as intimidating as the ogres are, they also have weaknesses that can be exploited to bring them crashing down—hopefully without destroying too many buildings in the process. The colourful ogres come clad in various types of armour, including wood, bone, and iron, which have to be destroyed in different ways before you can deliver the killing blow. This is where Avil’s Rune Strike comes in: a powerful move that lets you target a piece of armour, rapidly dash towards it, and destroy it. Wood is easily shattered, but for iron armour you have to be more precise with your strikes, destroying the padlocks holding it on. And when the ogres start rocking magic-infused armour later in the game, your method of destroying it only gets more complicated. When the armour is destroyed, you can directly attack the ogre, using Rune Strike to gruesomely sever its arms and legs. You almost feel bad for the thing as it swings hopelessly at you with a bloody stump, unable to get back on its feet. Limbs regenerate, however, so you have to quickly clamber up its back and lop its head off before it continues its rampage, providing you’ve dealt with any head armour it happens to be wearing as well. The fluid animation and size of the ogres makes killing them dramatic, but once you’ve figured out the handful of armour variations and the tactics required to deal with them, taking the monsters down can start to feel a little routine. The impact of your first few battles is undeniable, but that soon gives way to familiarity. Later on you’ll fight multiple ogres, some of whom wield weapons, but the fundamentals of killing them are essentially the same. Before you can even think about attacking one, you have to charge up your Rune Strike by rescuing civilians. Scattered around each map you’ll find teleport crystals and people cowering beside them, which can be activated to whisk the terrified citizens to safety. Doing so increases your rune power, as does killing the monsters that aggressively attack them. At ground level Extinction feels more like a hack-and-slash game, with chunky, arcade-like combat that’s enjoyable in short bursts, but ultimately quite shallow. 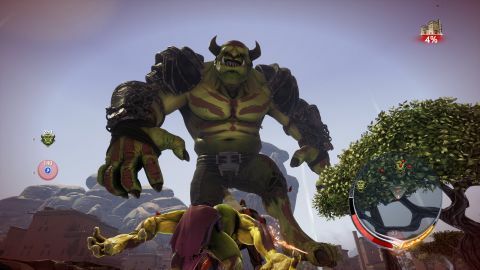 Speed is important too, because as an ogre galumphs around the map, it destroys any buildings in its path, lowering the Extinction meter at the top-right of the screen. If this hits zero and the city is completely destroyed, you’ll fail the mission, which is another plate you have to spin along with killing enemies, toppling ogres, and rescuing annoyingly helpless civilians. If the extinction meter gets dangerously low, sometimes luring the offending ogre away from the city is a better strategy than trying to kill it in a built-up area. There are a few ways to play Extinction, including a campaign and a randomly-generated skirmish mode. The campaign is a series of increasingly difficult missions attached to a lightweight, forgettable, story. This is the best place to start, as it introduces each system one by one until you’re fully equipped to deal with everything it has to throw at you. Then you can dive into the skirmish mode, which is the game at its most challenging and chaotic, with civilians dying and buildings collapsing all around you. An upgrade system gives some basic sense of progression, and Avil is able to jump higher, strike harder, and teleport people to safety faster as he spends points accumulated from successful missions. Campaign quests also have a ranking system, with optional objectives that will earn you more points to spend on skills. These could be finishing a mission above a certain extinction threshold or rescuing a certain number of civilians. Extinction is a polished game, from the slick UI to the snappy, responsive controls. Avil can double-jump, glide, and clamber up walls, which makes him feel satisfyingly nimble. And the game maintains a reliably solid frame-rate, even when those hulking ogres shamble into view and start smashing buildings. But there isn’t enough here to justify that £55/$60 price point. The ogres get harder to kill, new enemy types are introduced, and the maps change, slightly, but genuine surprises are few and far between.